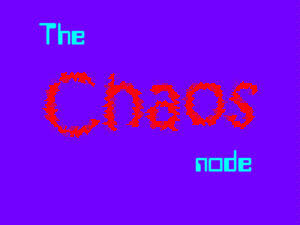 Pic of the day: I've made a new logo for the Chaos Node comic. But it's not all fun and games. My side was pretty bad today, getting worse over the day. It was mostly to the front today. The whole area around felt tender like the flesh around a wound. If I had fever, I would easily have believed I had an appendicitis this time. But luckily for us all, there was no fever, and so I stayed put and worked on my Sim comic reboot. Today was also probably the first time I laughed out loud in a bookstore. The main reason why I don't do this is that I know the difference between a bookstore and a library, even though some people don't seem to. (I don't mind much as long as they don't pick their nose, but in principle I think it is "theft light". Basically you are making a new book into a used book, which is a different product in our culture and sells at a different price.) I do read the covers however. This time I did not even need to go to the back cover to burst out in laughter. Late at night, I spent some time reading about the real thing, as befits the situation. I chose to read from the Gospel of St John. For a long time, I have found St John to be a very agreeable writer, despite the peculiar abstract beginning of the document. There was plenty food for thought this time too. I tell you the truth, we speak of what we know, and we testify to what we have seen, but still you people do not accept our testimony. I have spoken to you of earthly things and you do not believe; how then will you believe if I speak of heavenly things? (John 3, 11-12.) First off here, what Jesus had talked to him about just before was being born again of water and spirit. Jesus considered that "earthly things"? Or had they talked about other things before? Second, and most strangely, Jesus used the word "we", which he rarely uses. You may think this is the majestic plural, but Jesus uses third person instead when he wants to emphasize his glory, referring to himself as "The Son" or "Son of Man". Besides, he uses the singular "I" in the very next verse. What is going on here? Who are the others who speak of what they know and testify of what they have seen? The disciples? How much had they seen in the one chapter since he picked them up? Or are he implying that there were other witnesses? Possibly even other, lesser celestial visitors? Needless to say, that would be totally at odds with what all churches today teach. It may still be wrong, though. My position, right now, is "I don't have a clue". Think about it. The pharisees are so righteous, they give tithes even from their herb garden. Jesus basically tells them to go to hell. This lady has made a mishmash of the sacred institution of marriage, and shows no regret about it either, rather she goes like "Wow! Neat trick looking into my past!" and Jesus gives her theology that won't make sense until the dawn of the Age of Aquarius ... Makes me wonder whether something is lost in the translation here, or if Jesus really is that cool. My personal guess is that Jesus grouped people not by behavior but by their spiritual capacity, their ability to accept his radical new teachings. The pharisees and scribes had none, their minds were closed and locked and barred. This half-heathen housewife lapped it all up and then ran off to tell the whole village. Jesus must have seen that at a glance, even though I wouldn't.